The benefits of this quick-and-easy practice are supposedly many, ranging from brighter skin to improved digestion to a boosted immune system and beyond. Of course, these are all welcome side effects of staying well-hydrated, even without a lemon slice in your glass. Which raises an important question: Is that little squeeze of citrus actually doing much more for our bodies than plain water would? While there’s been some clinical research on the nutritional value of lemons since then, Dr. Matluck says there have been “few, if any, randomized, controlled studies” on lemon water, specifically. (Womp, womp.) “We know about the health benefits of many of the constituents of lemons, but we don’t have a good body of research to know if adding some lemon juice to your water provides a sufficient amount of any of these constituents to get all of the potential benefits,” Dr. Matluck explains. So does that mean we’re getting no benefit at all from putting lemon wedges into our S’well bottles? Not quite. Here, Dr. Matluck puts some of the most common claims around the benefits of lemon water under a microscope, based on the data we do have. Which of the benefits of lemon water are actually legit? Let’s investigate. Can lemon water help you heal faster when you’re sick? Unfortunately, if lemon water is part of your cold-proofing arsenal, it probably isn’t doing much of the heavy lifting. “Lemons are high in vitamin C, which is supportive to the immune system,” says Dr. Matluck. “But the amount of vitamin C you consume by adding lemon to water is not likely enough to boost the immune system.” The recommended daily allowance of vitamin C for women is 75 mg, and an entire lemon contains a third of that amount. Yet studies have found that more than 1 gram (1000 mg) per day of vitamin C is needed to help reduce the duration of a common cold. Can lemon water help to treat kidney stones? This one’s actually true, according to Dr. Matluck. “The citric acid in lemons can help break up and prevent certain types of kidney stones,” she says. Indeed, researchers have found that drinking 4 ounces of lemon juice (or orange juice, or melon juice) in tap water increases citrate levels in the urine—which, in turn, can help ward off kidney stones. Does lemon water actually balance the body’s pH? Some holistic health gurus stress the importance of eating alkaline foods—fruits and veggies, mainly—as a means of counteracting all of the acidic foods in the standard American diet, which are said to cause acidity in the body and, in turn, disease. (Think meat, dairy, and processed foods.) But that’s not actually the way our biochemistry works, says Dr. Matluck. “The pH of the body is very tightly controlled,” she explains. “Though lemons are considered an alkalinizing food, your diet will not significantly change the pH of your blood.” That said, tons of studies have found that eating a plant-heavy, whole-food-based diet is highly beneficial to health for reasons other than pH balancing, and lemon water can certainly be a part of that. Can drinking lemon water help a person manage their weight? Kind of—but maybe not for the reasons you’ve heard before. “Drinking lemon water on its own is not a sufficient weight loss strategy,” says Dr. Matluck. “However, it may be a supportive component of a more holistic program.” For one thing, a 2011 study showed that drinking water before meals can result in accelerated weight loss, presumably because the water helps promote feelings of fullness, which could prevent overeating. If you’re trying to cut back on sugar-laden drinks throughout the day, lemon water may be a more enticing alternative than plain water. Can lemon water promote healthier skin? Many a wellness influencer has credited her clear, glowy skin to her warm lemon water habit. But this probably has more to do with the water itself than the lemon. “Though vitamin C has been shown to provide benefits to skin, there is no evidence to support that consuming lemon water will do the same,” says Dr. Matluck. Staying hydrated, on the other hand, is indisputably one of the best things you can do for your complexion. So yes, keep drinking all the H2O—and, by all means, add lemon if you dig it. If vitamin C’s skin-protective properties are what you’re after, eat a wide range of foods with vitamin C and invest in a topical serum. Does lemon water help with digestion and detoxification? Again, this is probably a case where the water is the real MVP. “Hydration alone is supportive to the body’s detoxification processes,” says Dr. Matluck. But she says there isn’t compelling proof that lemon water specifically is better at detoxifying you than regular H2O. The same goes for the digestion piece, she adds—and besides, if you’re having digestive issues, your doctor should really be your first port of call. “There are many different causes for digestive problems so the first step toward treatment is identifying the cause,” she points out. So should we be drinking lemon water or nah? To sum all of this up, Dr. Matluck hasn’t seen enough science to suggest that drinking lemon water is superior to drinking regular water, if you’re not doing it to prevent kidney stones. But I’m not here to be a total lemon water buzzkill. 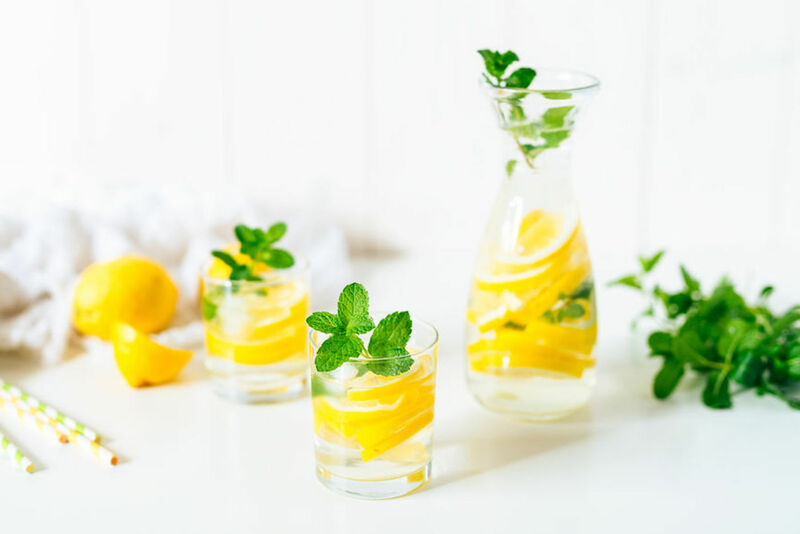 There is one other reason why you might want to go for lemon water, in Dr. Matluck’s opinion: “It does taste better!” If that’s gonna tempt you to drink a little more water—enough so that you’re peeing every 2-3 hours for optimal hydration—then bring on the sour stuff. Alkaline water is another wellness beverage with some dubious claims attached to it—here’s the 411. And if you still prefer it to the regular stuff, this is how to make alkaline water at home.